This longitudinal qualitative study, involving low-income parents and children, tutorial-agency staff, and one college student (all Latinx), took place in a city along the U.S./Mexico border. Data sources included field notes through participant observation, questionnaires, and interviews. The authors asked, “How are parents involved in their children's education? What limitations or barriers do they express?” Using a social justice framework and grounded-theory data analysis, these types of parental involvement emerged: academic, social skills, school volunteerism, extracurricular activities, community, and college enrollment. Conversely, parents expressed involvement obstacles. Implications relate to changing the deficit discourse regarding low-income, immigrant parents' involvement. Collaborating with families to create equitable educational outcomes for minoritized children is imperative. Some mainstream educators perpetuate negative discourse of Latinx immigrants’ parental involvement (Valdés, 1996), especially if parents do not speak English (Spencer-Rodgers & McGovern, 2002), are minoritized (Flores & Rosa, 2015), and are low-income (Altschul, 2012). Yosso (2006) critiqued the deficit assumption that “parents neither value nor support their child’s education” (p. 75). 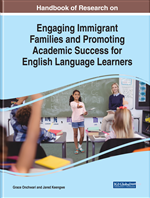 Despite obstacles, such as the English language and inadequate knowledge of the U.S. educational system, Latinx immigrant parents have high expectations for their children’s education and want to participate in their children’s academic success (Coronado, 2003; Gándara & Contreras, 2009; Hernández, 2003; Zalaquett & López, 2006). This topic is important because parental involvement in their children’s education correlates positively with their children’s academic success (Jeynes, 2016). In a meta-analysis of 42 studies of pre-kindergarten to college youth, Jeynes found a significant correlation between parental engagement, overall child outcomes, and child academic achievement. Specific to the topic of our chapter, Latinx parental involvement relates to their children’s academic success (Gándara & Contreras, 2009; García & Kleifgen, 2010; Zalaquett & López, 2006). Furthermore, although low socioeconomic status (SES) does relate to less involvement by Mexican-heritage parents, parental involvement is more salient than SES for student achievement (Altschul, 2012). In a national longitudinal study of 1,609 Mexican-heritage students, Altschul discovered that parental engagement “appeared to mediate the effects of income and mothers’ education on youth’s achievement” (p. 20). Likewise, Caspe (2009) concluded from her literacy findings of Latinx mothers and their children, “Demographic characteristics, such as maternal education, were not nearly as important in predicting children’s outcomes, as were booksharing styles” (p. 321). Additionally, Caspe, like UNESCO (1948), believed families to be foundational for their children’s development. In this particularly foreboding time in the USA and world, it is important to push back on the pathologizing, marginalizing discourse regarding the subaltern and to realize intersectionality in education, ethnicity, immigration, language, race, social class, and other factors (Anzaldúa, 2007; Berliner, 2009; Bussert-Webb, Díaz, & Yanez, 2017; Murillo, 2012; Yosso, 2006). We define parental involvement as guardians being supportive of academic and extracurricular activities, navigating school choices, conveying school’s importance (Harris & Robinson, 2016), and teaching their children social skills to function with peers and teachers (Bussert-Webb et al., 2017). Getting along with others is part of 21st Century career and life skills, involving emotional and social competencies (Partnership for 21st Century Learning, 2007). Epstein (1987) described six basic categories of parental involvement: parenting, communicating with the school, volunteering at the school, facilitating children’s learning at home, participating in decision-making at the school, and collaborating within the community to improve the education system. Families operationalize these categories in two dimensions: participation at home and school. We found these categories present in our study, except for participating in decision-making at school. This decision-making input of nondominant parents relates to Fraser’s (1997) concept of representative justice. Additional Language: A language besides one’s mother tongue (e.g., Spanish may be a bridge or additional language between one’s indigenous tongue and a third language, and English may be a target or additional language in the USA for people who speak other languages). ROTC: Reserved Officers Training Corp, in which high school and college students may participate for credit-earning courses. Recent Immigrants: People who have recently arrived in a new country from another country and who plan to stay in the adopted country for more than a vacation. GED: General education development, equivalent to a high-school degree in the USA and Canada. The American Council on Education (ACE) coined the acronym and owns the trademark. The high-school equivalent may have different names in a few U.S. states. Many states require test-takers to be at least 17. Latinx: A recent term for Latino, meant to affirm transgender students. Also, Latinx (versus Hispanics) is used to indicate people who have more affinity toward the Americas than Spain. Mother Tongue: Heritage language, native language, or first language.